Amma has blessed seedlings from the second crop of organic rice our farmer’s group in Sadivayal, Tamil Nadu is growing. This week, two of the members brought her some of the first results so Amma could assess what is happening. There has been one challenge so far this season. Some wild pigs came and destroyed about two acres of sprouting seeds. The farmers, though, are not worried, as their seedlings are now growing well and they can replant there. 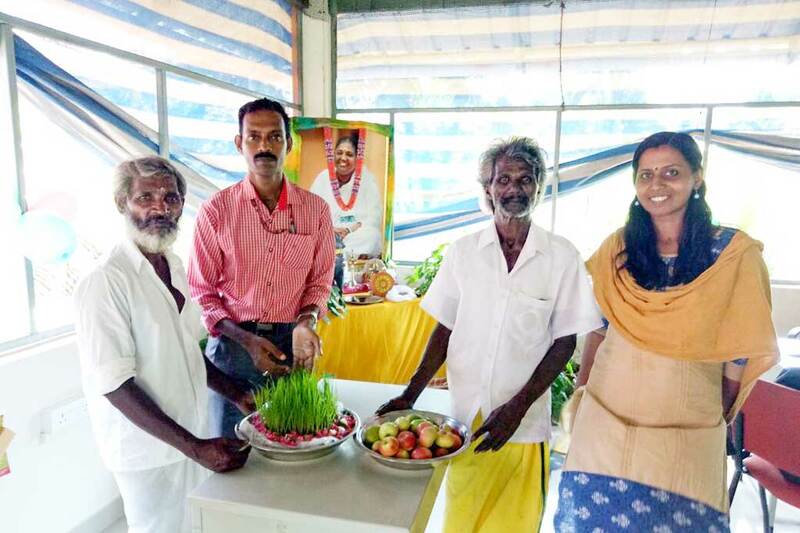 Vallingiri - farmer from Sadivayal, Sreeni KR - Village Coordinator, Rangaswami - farmer from Sadivayal, and Soumya - Amrita SeRVe sevite: in preparation to take sprouts to Amma. Sreeni K.R. is Amrita SeRVe’s village coordinator in Sadivayal, He explained that government officials are now visiting Sadivayal every week to monitor and support what is happening with the organic farming. The Sadivayal farmers group is also holding sessions with neighbouring villages to share with them what they have learned about how organic farming works and the positive impact it has on health and the environment. “Our hope is that all will begin this practice,” says Rangaswami.